For the recent season, see The Voice of Germany (season 8). For international syndication, see The Voice (TV series). The series consists of three phases: a blind audition, a battle phase and live performance shows. Four judges/coaches, all noteworthy recording artists, choose teams of contestants through a blind audition process. Each judge has the length of the auditioner's performance (about one minute) to decide if he or she wants that singer on his or her team; if two or more judges want the same singer (as happens frequently), the singer has the final choice of coach. Each team of singers is mentored and developed by its respective coach. In the second stage, called the battle phase, coaches have two of their team members battle against each other directly by singing the same song together, with the coach choosing which team member to advance from each of four individual "battles" into the first live round. Within that first live round, the surviving four acts from each team again compete head-to-head, with public votes determining one of two acts from each team that will advance to the final eight, while the coach chooses which of the remaining three acts comprises the other performer remaining on the team. In the final phase, the remaining contestants (Final 32) compete against each other in live broadcasts. The television audience and the coaches have equal say 50/50 in deciding who moves on to the final 4 phase. With one team member remaining for each coach, the (final 4) contestants compete against each other in the finale with the outcome decided solely by public vote. In Season 2, the battle format was extended into the live shows. The eight contestants in one team competed in battles until one finalist is left. The winner of these battle was selected by a 50%-mixture of a coach and televoting. In Season 3, the live show battle format was abolished after it was criticized that popular contestants had to compete against each other. The number of live shows was reduced from six to four. The knockout round where contestants who succeeded from battle rounds compete for live shows was introduced in this season. It was first seen in the third season of The Voice US. The Cross-battle was also introduced in season 3 and was extended to season 4. In season 5, four contestants received the highest vote from the public advanced to the Live Finals regardless of what team they are from. But from the sixth season onwards, only one contestant from each team who received the highest vote out of their teams' top 3 was sent to the finals. In April 2011, ProSieben announced its intention to bring an adaptation of The Voice of Holland to Germany. In July 2011, ProSieben began announcements of the coaches/judges for the series. First to sign on were Nena and Xavier Naidoo. Rea Garvey, "Boss Burns" (Alec Völkel) and "Hoss Power" (Sascha Vollmer) joined in late August 2011. Stefan Gödde was announced as the first season's host. Doris Golpashin was hosting the backstage special for the official website. – Winning Coach/Contestant. Winners are in bold, eliminated contestants in small font. – Runner-Up Coach/Contestant. Final contestant first listed. – 3rd Place Coach/Contestant. Final contestant first listed. – 4th Place Coach/Contestant. Final contestant first listed. Season 1 premiered on ProSieben on 24 November 2011. RTL's successful talent show Das Supertalent was scheduled at the same time as The Voice of Germany. While RTL achieved higher viewer figures with 5.83 million viewers (18.1% market share) compared to The Voice of Germany's 3.89 million viewers (12.4% market share), the ProSieben show was more popular amongst the 14-49 target group, with 3.06 million viewers (23.8% market share) compared to Das Supertalent's 2.99 million viewers (22.8% market share). The following day, The Voice of Germany aired on Sat.1 for the first time. On Sat.1, The Voice of Germany increased its viewers to 4.36 million (14.3% market share) and viewers in the 14-49 bracket remained almost the same at 3.05 million viewers (26.6% market share). The show saw a significant drop in ratings during the live shows. The final was watched by 4.01 million viewers, a market share of 12.9%. Winner Ivy Quainoo debuted at #2 on the German Media Control charts with her debut single "Do You Like What You See", while the other three finalists also made it into the top 20. After a successful Season 1, Prosieben and Sat.1 decided to run another season in 2012. The format of the show stayed the same and all four judges returned for season 2. In June 2012, it was announced that Stefan Gödde would not return for Season 2, because of other projects. He was replaced by actor Thore Schölermann. Season 2 premiered on 18 October 2012 on Prosieben. It was the most popular program that day with 4.69 million viewers (15.5% market share) and 3.46 million viewers among the 14-49 target group (28.5% market share). The program achieved record ratings the following day with 5.24 million viewers and a market share of 21.9%. The winner of the second season was Nick Howard with his song "Unbreakable". The song debuted #5 on the German Media Control charts. After the successful ratings in the blind auditions in Season 2, Prosieben and Sat.1 announced a third season in 2013. After major speculations it was announced in August 2013 that Xavier Naidoo and Rea Garvey would leave the show for other projects. They were replaced by Samu Haber and Max Herre. Nena and The BossHoss returned for their third season as coaches. Thore Schölermann returned for his second season as host. Season 3 began on 17 October 2013 on Prosieben. It was the most popular program that day with 4.03 million viewers (13.5% market share) and 2.73 million viewers among the 14-49 target group (24.1% market share). The rating was 660,000 fewer viewers than the series 2 launch. On 18 March 2014, Alec Völkel and Sascha Vollmer of The BossHoss announced that they would no longer be coaches for the fourth season. Five days later, Nena also announced her exit from the show. On March 27, 2014, Michi Beck & Smudo of Die Fantastischen Vier was announced as The BossHoss' replacement. On 3 April 2014, Samu Haber announced on Facebook that he would coach in the fourth season. On 6 May 2014, it was announced that Max Herre had left the show, but Rea Garvey returned after one season hiatus. On 3 July Silbermond frontwoman Stefanie Kloss' management announced that she would replace Nena on the jury. This season was again hosted by Thore Schölermann and the backstage presenter was Doris Golpashin. The winner of the fourth season was Charley Ann Schmutzler from team Michi & Smudo with her song "Blue Heart". In early May 2015, Samu Haber announced his exit from the show. He was replaced by Andreas Bourani. The other three coaches remained on the show. The backstage presenter Doris Golpashin was replaced by Lena Gercke. The winner of the fifth season was Jamie-Lee Kriewitz from team Micho & Smudo with her song "Ghost", which was also the German contribution to the Eurovision Song Contest 2016 a few months later. At the end of April 2016, it was announced that Rea Garvey would leave the show and Samu Haber would return. On 14 June 2016, it was announced that Michi Beck & Smudo and Andreas Bourani would continue to be coaches, whereas Stefanie Kloss would be replaced by Yvonne Catterfeld. On 15 September 2016, it was announced that the show would be broadcast on ProSieben on Thursdays and on Sat.1 on Sunday from 20 October 2016. The winner of the sixth season is Tay Schmedtmann from team Andreas. For the seventh season, Andreas Bourani was replaced by The Voice Kids coach Mark Forster. Yvonne Catterfeld, Samu Haber as well as Michi Beck and Smudo all returned. Also hosts Thore Schölermann and Lena Gercke remained on the show. The season started on 19 October 2017 and ended on 17 December 2017. The winner is Natia Todua from team Samu. None of the finalist sang their original song this year. During the seventh season, it was announced that there would be an eighth season in 2018. Host Lena Gercke and Thore Schölermann remained. In May 2018, the management of Samu Haber confirmed that he would not be a coach for the eighth season. He was replaced by Michael Patrick Kelly. Yvonne Catterfeld, Mark Forster and Michi Beck & Smudo all returned as coaches. ^ Lückerath, Thomas. "ProSieben startet Castingshow "The Voice of Germany"". dwdl.de (in German). Retrieved 12 October 2011. ^ Morabito, Andrea (28 February 2011). "Cee Lo Green, Adam Levine Named Coaches of 'The Voice'". Broadcasting & Cable. Retrieved 2 April 2011. ^ Alexander, Krei (11 July 2011). ""The Voice": Nena und Naidoo sind in der Jury". dwdl.de (in German). Retrieved 20 October 2011. ^ Alexander, Krei (25 August 2011). ""The Voice of Germany": Die Coaches sind komplett". dwdl.de (in German). Retrieved 20 October 2011. ^ Krei, Alexander (20 July 2011). ""The Voice": ProSieben und Sat.1 wechseln sich ab". dwdl.de (in German). Retrieved 20 October 2011. ^ Weis, Manuel (12 October 2011). ""The Voice"-Backstagereporterin kommt aus Österreich". quotenmeter.de (in German). Retrieved 20 October 2011. ^ "Bohlens "Supertalent" gegen Nenas "The Voice": Zoff der Castingshows!". Bild (in German). 4 November 2011. Retrieved 25 November 2011. ^ ""The Voice" vs. "Das Supertalent": Das Castingshow-Duell des Jahres". Bild (in German). 23 November 2011. Retrieved 25 November 2011. ^ Weis, Manuel (25 November 2011). ""The Voice": Starke Quoten für starke Show". Quotenmeter.de (in German). Retrieved 25 November 2011. ^ Niemeier, Timo (26 November 2011). ""The Voice" legt in Sat.1 sogar noch zu". Quotenmeter.de (in German). Retrieved 26 November 2011. ^ Mantel, Uwe (11 February 2012). ""The Voice": Gutes Finale, doch unter Bestwerten". dwdl.de (in German). Retrieved 25 October 2012. ^ Krei, Alexander (31 January 2012). ""The Voice": ProSieben & Sat.1 planen zweite Staffel". dwdl.de (in German). Retrieved 25 October 2012. ^ Krei, Alexander (5 September 2012). "Zweite Staffel von "The Voice" startet Mitte Oktober". dwdl.de (in German). Retrieved 25 October 2012. ^ Lückerath, Thomas (16 June 2012). "Schölermann übernimmt "The Voice of Germany"". dwdl.de (in German). Retrieved 25 October 2012. ^ Mantel, Uwe (19 October 2012). "Grandioser Auftakt für "The Voice" und "Quizboxen"". dwdl.de (in German). Retrieved 25 October 2012. ^ Mantel, Uwe (20 October 2012). "Neuer Rekord: "The Voice" legt noch deutlich zu". dwdl.de (in German). Retrieved 25 October 2012. ^ Krei, Alexander (16 August 2013). "Starttermin für dritte "The Voice"-Staffel steht fest". dwdl.de (in German). Retrieved 18 October 2013. ^ Mantel, Uwe (18 October 2013). ""The Voice" siegt trotz deutlichem Quotenrückgang". dwdl.de (in German). Retrieved 18 October 2013. ^ "The BossHoss verlässt «Voice of Germany»" (in German). 18 March 2014. Retrieved 25 March 2014. ^ "Nena schmeißt bei "The Voice of Germany" hin" (in German). 24 March 2014. Retrieved 25 March 2014. ^ "Michi Beck und Smudo werden neue Juroren" (in German). 27 March 2014. Retrieved 29 March 2014. ^ "Nenas NachfolgerinDarum geht Silbermond-Steffi zu „The Voice"" (in German). 4 July 2014. Retrieved 5 July 2014. ^ ""Nennt mich faul, aber ..."„The Voice"-Schock: Juror Samu Haber steigt aus" (in German). 5 May 2015. Retrieved 5 May 2015. ^ "Echo-Gewinner Andreas Bourani wird "Voice"-Coach" (in German). 28 May 2015. Retrieved 30 May 2015. ^ "ProSieben holt Lena Gercke für Primetime-Shows" (in German). 10 June 2015. Retrieved 11 June 2015. ^ "+++ VIP-News +++Rea Garvey verlässt "The Voice of Germany" - Samu Haber kommt" (in German). 30 April 2016. Retrieved 30 April 2016. ^ "ALLE STÜHLE SIND BESETZT!" (in German). 15 June 2016. Retrieved 16 June 2016. ^ "Jury-Wechsel bei „The Voice"" (in German). 20 June 2017. Retrieved 21 June 2017. ^ "Schade, schade. Samu Haber macht "The Voice of Germany"-Pause" (in German). 19 May 2018. Retrieved 21 May 2018. 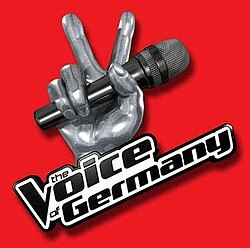 ^ ""The Voice of Germany" komplettiert die Coaches mit Michael Patrick Kelly" (in German). 21 June 2018. Retrieved 21 June 2018.